The very first scene seen in episode 01 offers enormous emotional depth when Daigo talks about his father and tells about his dreams in front of the class. The empty baseball fields at sunset work as the perfect, powerful backdrop while a soundtracks from the original series starts playing. The inability to meet the expectations set for him and the lack of natural talent required to follow his father's footsteps are the very core of his character. But he is not his father. It's time for him to be himself. When I started watching Major 2nd, I didn't expect it to hit me in the feels with a baseball bat already in the first episode. This is the 7th season for the Major franchise, and it's nothing less than a love letter to its fans. The story is once again far from being perfect. The beginning suffers from compromises that were made in purpose of making this season watchable to a new audience that hasn't seen the original 6 while simultaneously trying to create the next generation of Major and its setup. The pacing is rather weird and jumpy, time skips happen already in very early stage. The 2nd main character introduction is random and could be called to be based on coincidences alone just to create the preferred settings for the anime itself. Basically the first 7 episodes are rather mediocre and messy, but once the beginning is left behind and the story starts advancing, we get a more consistent flow centering around the familiar things that Major has always done so successfully. The characters are fun to follow. Daigo's sister is absolutely lovely. She has clearly inherited her mother's temper. The voice acting alone makes me smile uncontrollably because the seiyuu work delivers so much personality. Especially the adult version of Shimizu has turned out fantastic. Daigo's pondering and uncertainty can be little annoying and feel filler-ish at times, but what it also did was leave more room for character development which Major 2nd relies almost as much as its predecessor. The romantic subplot plays much bigger role and the potential love interest is full of charm, much like all female characters in the series. The single best part of the cast is how there is not a single anime character in it. Anime as an adjective I mean. Everyone follows the realistic pattern where characters rely on their personalities. In one way, this is the polar opposite of let's say Kuroko no Basket where character specific skills/talents are essentially superpowers, personalities follow archetypes and character designs is based on the "spot the main character" tier fakeness. Major is downright genuine work, relying on itself and not on common tropes that create false appeal. When it comes to balance, that is certainly among the most impressive sides of this season. Every bit of drama and character centric insecurities are overcome during the baseball games where character development, character relations and sport intelligence all continue to advance. Seeing how our cast grows closer to each others while growing as persons as games advance, is the perfect example of awe-inspiring. Yet, at the same time, the matches itself exist as baseball games on the surface level, and the importance of this hasn't been forgotten. The smoothness creates a rather magnificent atmosphere that manages to make the series incredibly entertaining and offer a fresh experience. In one way, Major 2nd is nothing but light slice of life drama centering around baseball and focusing on character relations and development. It's a widely used formula in the sports genre and those who have never seen this to be anything special won't be changing their minds here either. What I see is an endless potential and Major 2nd is yet another massive success that managed to live up to its potential and offer beauty that can only be achieved under these settings. Right at the outset, let me say this. Its major, but don't expect the first season of major here in '2nd'. And oh, spoilers in the review. TL;DR - Its a great anime, but if you hold high expectations of this like i did, then maybe you might be slightly disappointed. However, it's still worth the watch and i have high expectations of subsequent seasons. If you're a fan of Major, definitely go ahead and watch. If you like sports anime in general, give it a chance, see if you like it. I'm sure subsequent seasons will be really good and this might be important for those. This season of this possibly long series basically tackles the question of how expectations might affect a second generation (third actually) of a professional athlete family. And it portrays it well. Just it's not that interesting to me. 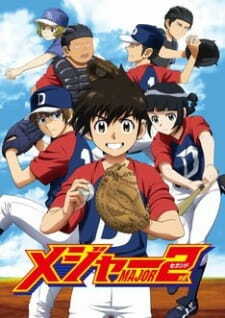 The original major, the entire series, was a testosterone filled, action packed and at times tear jerking series about the triumphs of Goro in his journey of becoming a baseball player. The first season of it as well fits that description. It was also about establishing the motivation of Goro, the early trials that he faced like his father's death, the motivation Gibson gave him and the like, and while great in itself, it largely helped propel subsequent seasons to greater emotional heights because we knew what Goro went through. His father's death and that epic match at the end of the tournament in the first season. I came into this expecting similar things. Now when i compare that with the new mc, daigo, and his inability to cope with expectations placed on him because of his father's success, it just didn't have the same impact. I kept expecting Daigo to come up with a cool move or show inhuman determination that made everyone acknowledge his genius and make my spine tingle and my hairs stand on end. He doesn't. The show itself doesn't. And i guess the point is, the show and he shouldn't. Those kinds of things would be at odds with the theme its trying to deal with. Major 2nd feels much more grounded. Daigo, at least for now, isn't a baseball genius. The show repeatedly pounds you with that early on. The progress he makes throughout the show in terms of skill are minor (like learning how to bunt). Even later on, he doesn't make as much of an impact on games like Goro did. Mostly it's daigo's best friend, and satou's son, Hikaru, who is shown to be the baseball genius that the team needs to win games. And apart from him, the emphasis is more on Daigo dealing with his inferiority complex and how the entire team contributes collectively to their, and Daigo's, success. The show has its moments however. It shines when there are matches to be played instead of conversations. The baseball is exciting as ever which kept me watching this. We look at what a few of the characters from the earlier season are doing and the final match of the show is great as well. Its basically a second generation version of the last match Goro had while a part of Kaido. In terms of characters that is, not epicness. It pales in comparison to the last match of major's first season as well. And i say that while not exactly remembering the specifics of how that match played out. This series still has a long way to go to get to those heights. A bit of a cursory comment on the other aspects. Art is good, nothing standout, consistent throughout. Sound...hmm i don't remember much about this lol. OP is ok. The second ED is just 'Uhh!'. That was long, and i probs repeated myself more than once, thanks for reading. Here's hoping there is more baseball and badassery next season. This is the perfect sequel to MAJOR! Coudn't have asked for more!! Really really hoping that this series will continue along with the manga,as MAJOR once did.This was really great. One of the first questions people seem to ask is "Do I need to like baseball to like Major?" Well I dunno. Do you need to like school to like Great Teacher Onizuka? Do you need to be otaku to like anime? Do you need to be retarded faggotass to like Guilty Crown? Well, those questions doesn't matter. The point is, almost everything I know about baseball is because I watched Major. Almost none plays it in my country anyway. Do I like Major then? If you still don't know then you probably got that Guilty Crown question wrong. Honestly didn't like the first couple episodes, but it brought me in the same way the original Major did. The setting/premise for the series was perfect. Gotta admit the character growth was larger than i expected. It brought tragedy in like how the original series did, which I didn't think it would. I liked how they played that. It made us focus on other characters problems, which again followed the original series. I didn't like how when they pitched or hit, there were sparkles. Bad animation choice. But that final episode was amazing. Brought in all the feels. Overall great series if you watched the original one. And if you're new I'd say it is a good one with some weird problems. But if they follow suit and provide multiple seasons, it'll grow into something big. Likelihood of a Second Season?